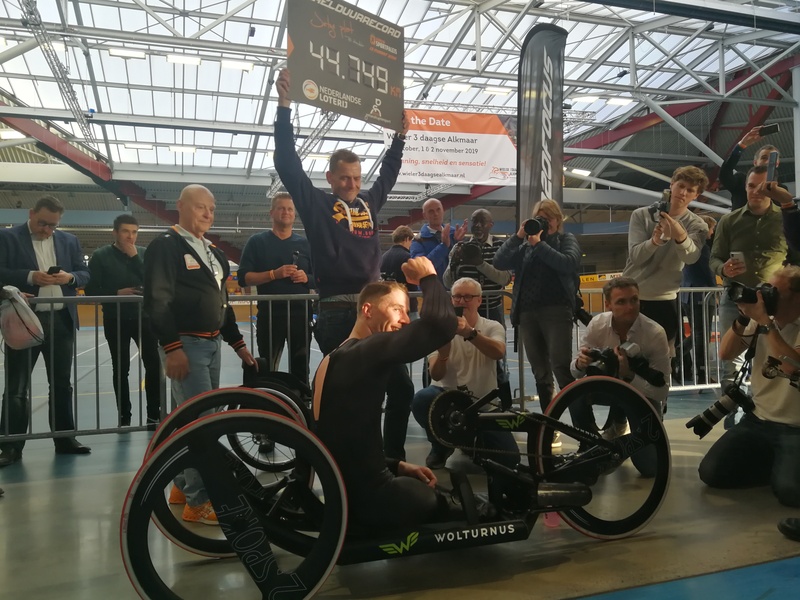 The new world hour-record is there….. Jetze Plat (NL) did it: 44.749 km on arm power only and with the 2-SPOKE wheels. Martin Toft Madsen is also the guy who did a test for attacking the world hour-record two weeks before Dion Beukeboom from the Netherlands did an attempt in Mexico. Martin rode this test in almost complete anonymity but rode about 1.5 km further in one hour then Dion…. He will make a serious attempt later on with the use of the 2-Spoke wheelset. 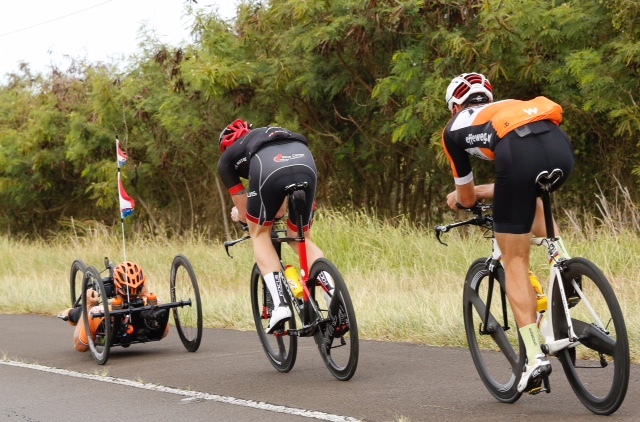 Despite the fact that Remco was recovering from a hip fracture which he sustained during a bicycle crash earlier this year, he still continued training for this National Dutch Time Trial Chapionship. 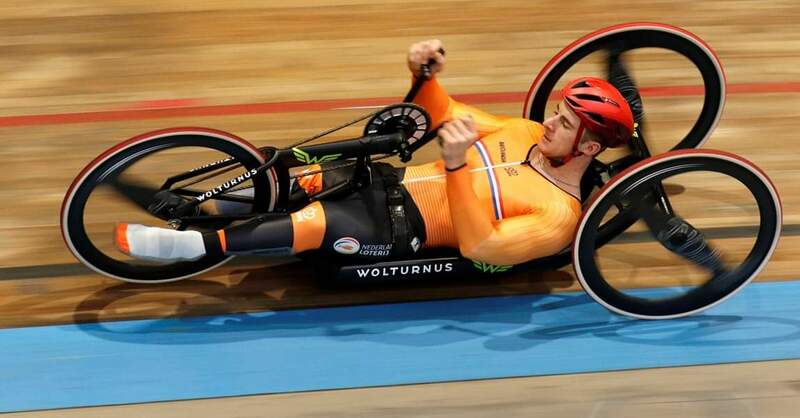 Although he had the fastest time after the first 25 km lap, this same hip fracture caused him to slow down in the second lap … But nevertheless he catched a fantastic third place despite this enormous handicap! With a total time of 1 hour, 3 minutes and 5 seconds she beat nr. 2 with 32 seconds thanks to the fastest biketime of the day! 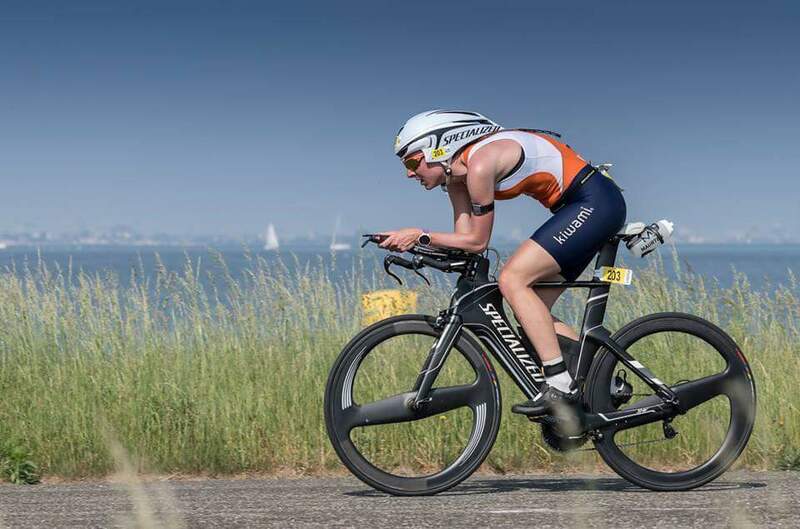 After a very nice third place on the European Championships Duathlon earlier this month in Velje, Denmark last weekend Marina catched the first place during the Dutch Championships Duathlon in the Netherlands with the 10 km running, 60 km biking and 10 km running in 2.58.41. Especially with biking she took a large lead. Successful last week of April 2018 with again three victories of three different top athletes using our 2-Spoke wheels. 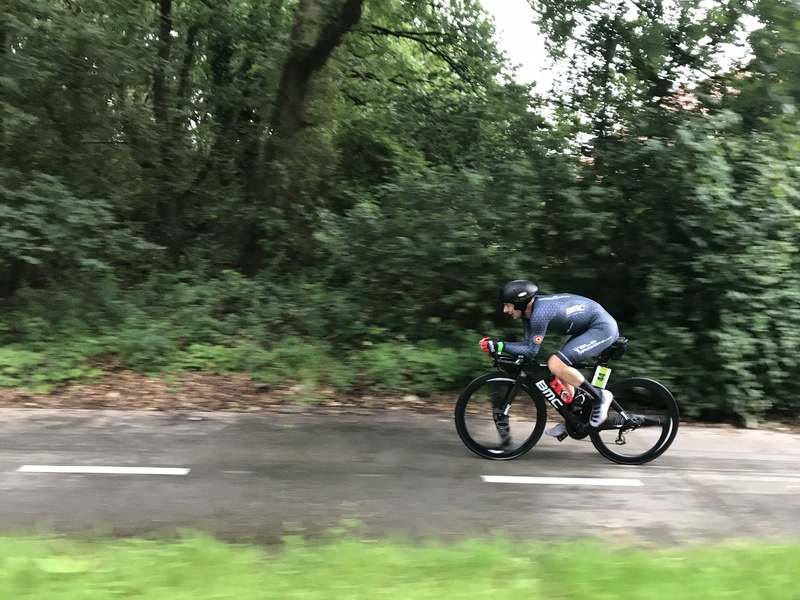 World Champion timetrial 2017 Remco Grasman wins his first 2018 season time trial in the Netherlands while recovering from his hip fracture…..! 1st, 2nd and 4th place during 42.8 km time trial with 2-Spoke wheelsets! 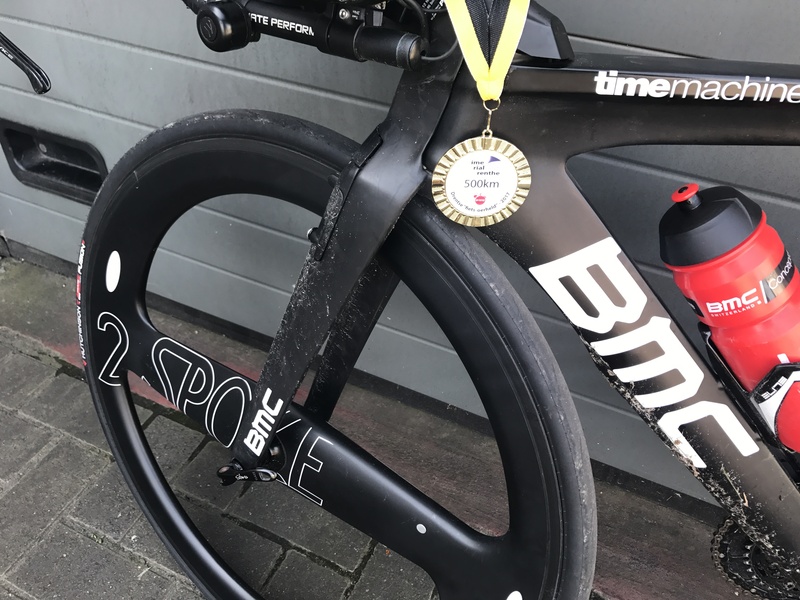 Last Saturday Dutch triathlete Sarissa de Vries achieved a convincing victory on the Almere Time Trial 2018 with her brand new 2-Spoke wheel-set. She got a first place in the woman age group 16-40 with a average speed of 41.09 km/h (25.53 mph). Marina van Dijk catched a nice 4th place with an average of 39.42 km/h (24.49 mph). In this first time trial of the new 2018 bike season a first place was reached by elite cyclist Wieger van der Wier. He needed 11.06 minutes for the 9.2 km track distance (49,72 km average or 30.9 mph.) Third place and also using 2-Spoke wheels was Bert Smilda in 11.22. A powerful start of the 2018 bike season…! The clap skate of road racing? 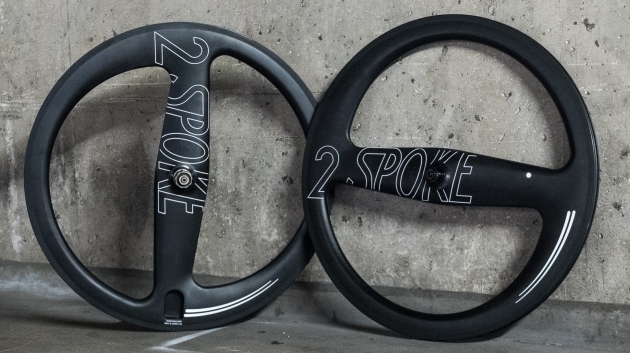 A bicycle wheel with two spokes: an innovation by which Dutch inventor Bram Moens wants to conquer the world of cycle racing. 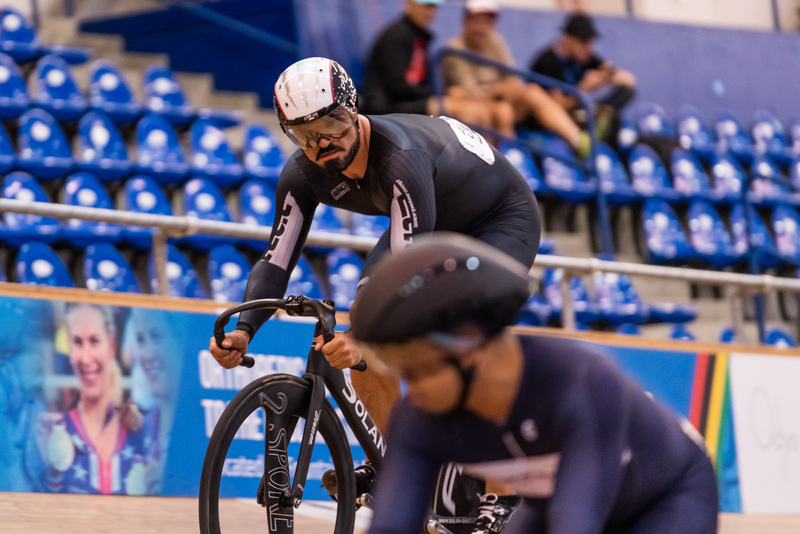 This doesn’t happen without effort, but BNR spoke with a racer who, since using the wheels, has increased his speed so dramatically that he’s completely convinced. 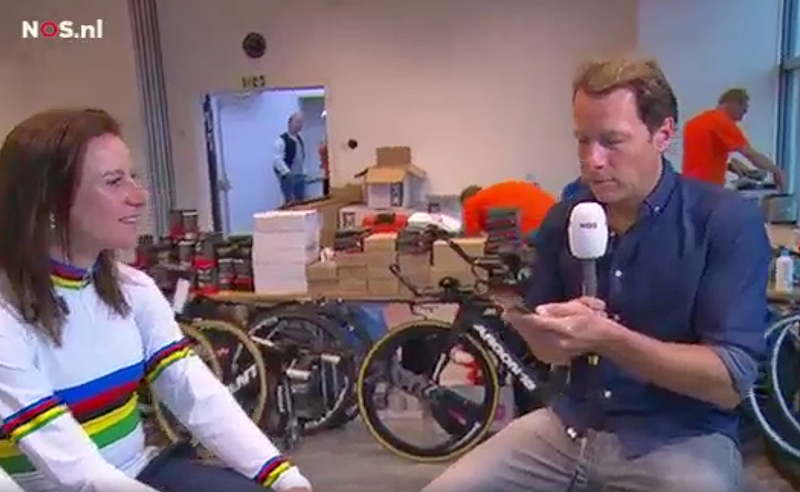 The 45 year old Remco Grasman is a so called elite racer without contract and the best time trial rider in our country; in the category 45 plus he even became world champion. The uses the Moens two spoke wheels and says he has become much faster on his bike. “A first race conformed it immediately”, Grasman says. “It was a short time trial of 7 kilometres. I cut 12 seconds of my personal record. That’s a lot on 7 kilometres.” He didn’t believe immediately that it was because of the wheels. “I thought, well, it’s a coincidence. The second race I also won with superior numbers (…). So I increasingly attributed it to the wheels. Sunday, October 8 th, ready for the large “Red Bull Time Trial Event 2017”. For the first time, I (Dylon de Kok) could use the 2-spoke wheel-set. Luckily I didn’t miss this experience! After 22 km I already was 1 minute and 40 seconds ahead at number 2. Already 200 “leaders” were started. At first I was a little skeptical about the advantage of the 2-spoke wheels, but this completely disappeared after this first part of the 100 km. It even converted into extreme enthusiasm. Around the 20 km marking point, a team member joined me to strengthen the team. Everyone acknowledged the benefits of the 2-spoke wheels. It also became clear to my teammates that I deviated less from my straight line than riding a disc rear wheel. At 17 km from the finish we were 3 minutes ahead of the 2nd team. Unfortunately, I got a flat …Eventually we ended up (having to change the tube) in a nice second place, 34 seconds of the winning team. Next season I will ride my time trials on this fastest wheel set of our planet: so obvious! Jetze Plat realized an incredible IRON-MAN HAWAII triathlon in only 8.41.47 hour thus finishing 26th overall of 2232 nd total! With this list Jetze finished well below 9 hours in his very first complete triathlon at the World Championships in Kona, Hawaii last weekend. His respective times were 53.14 min. for the 3.8 km swimming, 5.25.18 for the 180 km biking, and 2.19.20 for the marathon. The use of the 2-Spoke wheel-set contributed well to this phenomenal result! Images will follow soon. Coming Saturday there will be THE annual and by far most prestigious Iron-man of the year in Kona, Hawaii. As a new brand, but with large expertise, we are proud to have some of the fastest athletes using our record wheels. 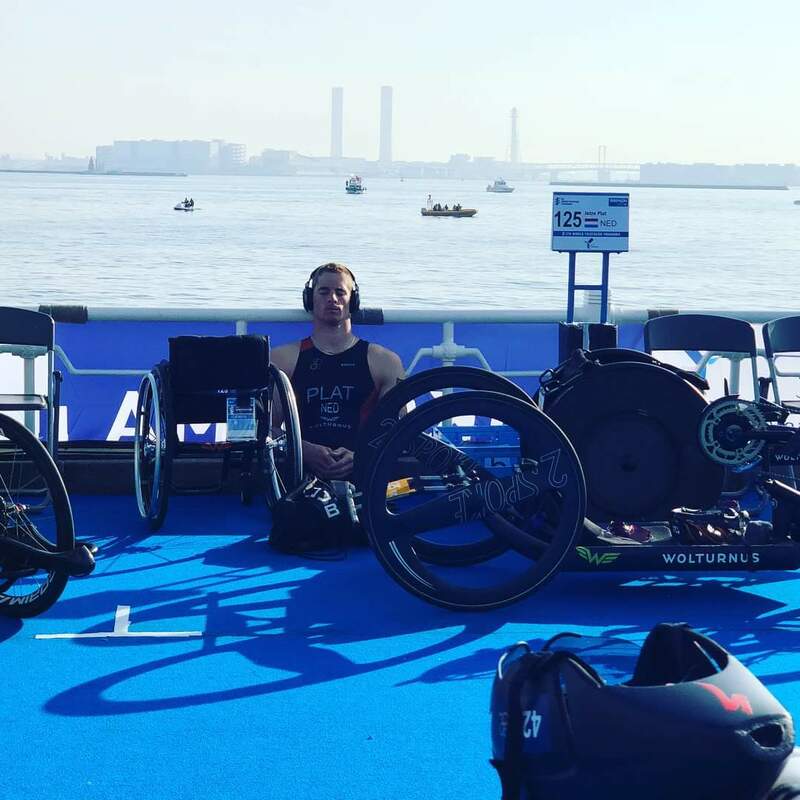 Among them one of the big favorites: top athlete Jetze Plat from the Netherlands who will take part in the para-triathlon division. He’s in a very good shape this year (became e.g. World Champion and gathered much, much more titles). Besides that we have some triathletes from Denmark and the Netherlands as well. 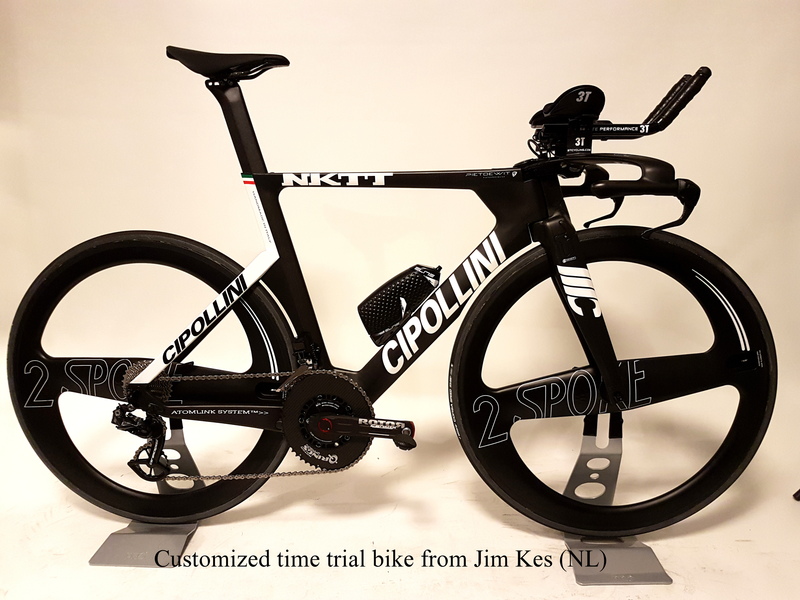 Joris Rogiers from Belgium set an amazing average speed on the tacho during a large international 500 km time trial event last summer in the Netherlands winning the first prize. 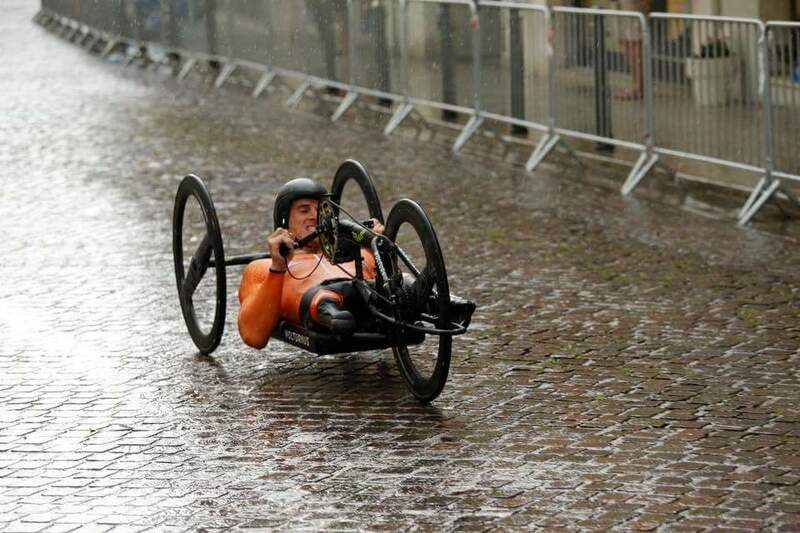 Despite cold and rainy weather he achieved an average speed of 36.63 km/h which is equivalent to 22.77 mph. As shown on his bike computer he even did some 5 km extra. Probably the choice of wheels for the next race! 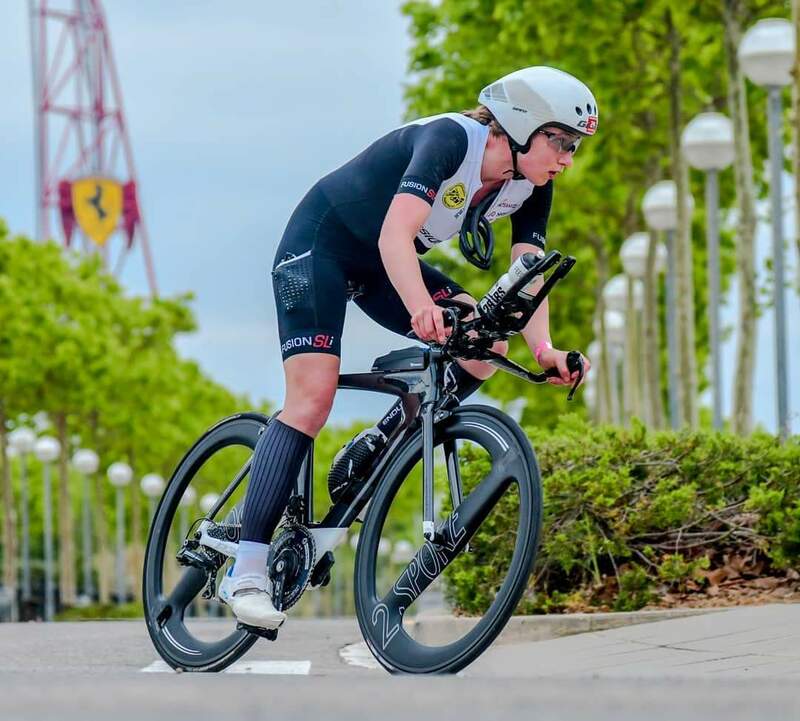 Sarissa de Vries used 2-SPOKE wheel-set on Almere Triathlon (NL) September 9th, 2017 and gets silver medal !! Check out the video below. 2-SPOKE action at 2 hours 23 minutes. TOP RECORD MONTH for the 2-SPOKE wheels! 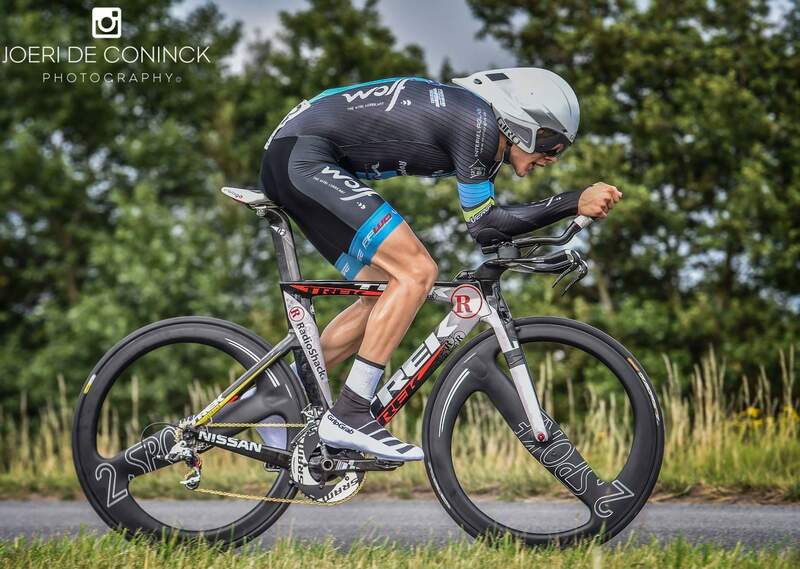 Remco Grasman world champion at UCI World Championships Time Trial in Albi France, using 2-SPOKE wheel-set! After a very successful time trial season ( with 15 out of 16 first places!) 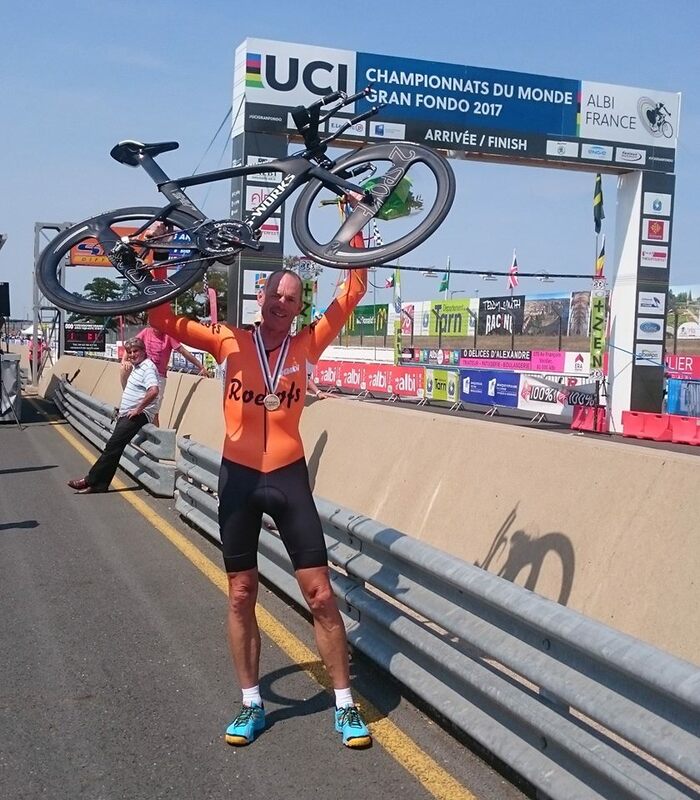 Remco Grasman from Emmeloord (Netherlands) has become world champion time trial in the elite without contract in his age category (45-49). 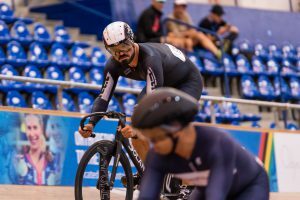 He managed to cover the 22 kilometres in 30 minutes and 21 seconds on the time trial course in Albi, France, using the M5 2-SPOKE wheel-set. A beautiful apotheosis for Remco; after this world championship he’s planning to slow things down a little. With a mere 1 minute and 22 seconds ahead of number two the difference in speed was like 1.6 km/h ( 1 mph). No category showed so much difference in speed between number one and number two then Remco’s. 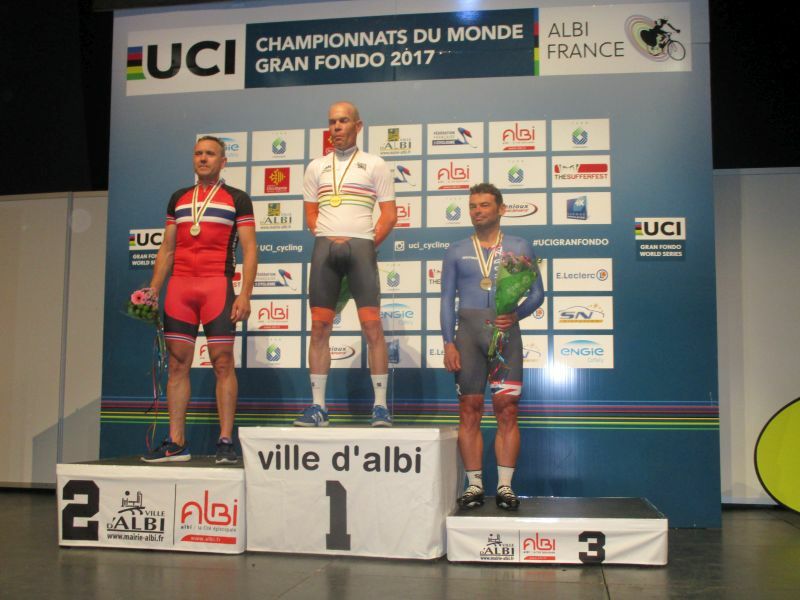 During the time trial course in Albi, France, Pieter ended third in the age category 55-59. More info & pictures on his Facebookpage! “Top time trial specialist Remco Grasman from the Netherlands is heading for the UCI World Championships at Albi in France on the 24th of August now he has received a wildcard from the National Dutch Cycling Federation. With 15 out of 16 wins Remco has a marvellous season up till now! The only time trial he did not finish first (but still a 3rd place) was due to a flat tire and physical problems (thrombosis). Despite his age, 45-years old in September, his shape and speed are still increasing also thanks to the use of top material like his 2-SPOKE wheel-set and the support from his trainer Guido Vroemen (who is e.g. trainer of World Champion Hand-biking and Paralympic Triathlon Champion Jetze Plat). Jetze Plat is also a enthusiast user of the 2-SPOKE wheel-set during all his games. 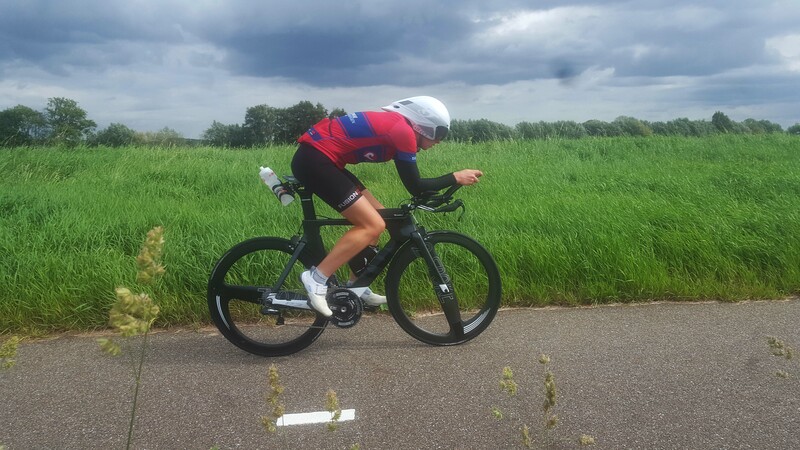 LATEST NEWS: During a 45+ km time trial at Heerde on August 6, 2017 Remco finished first again with an astonishing 48.2 km/h average despite strong winds of Bft. 4/5 and three mean steep hills. Pushing the pedals with Beaufort 4-5! 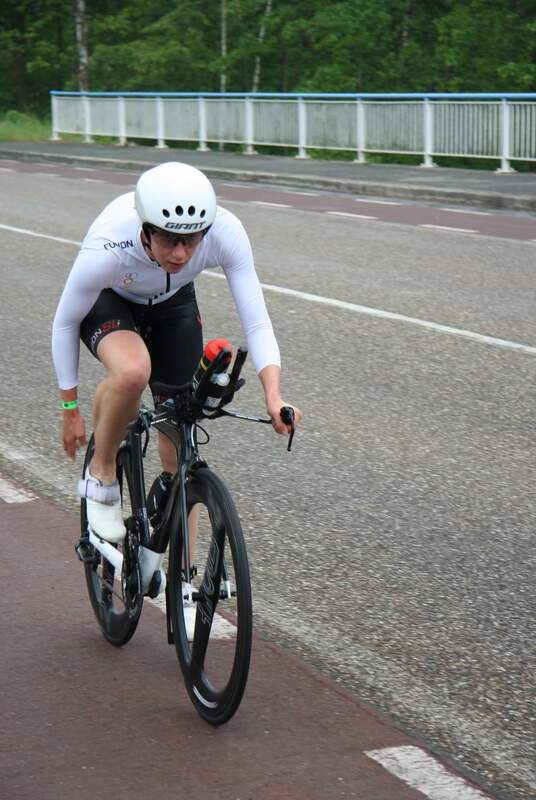 Rune Herregodt, 19 years old , 2nd during Belgian National Championships Time Trial, using 2-SPOKE wheel set! 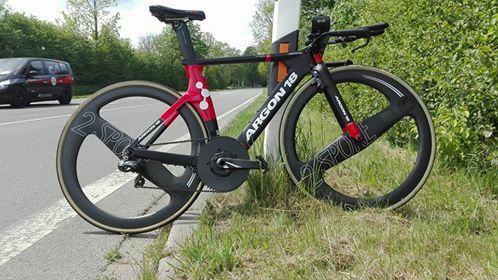 Rune Herregodt, only 19 years old, but racing in a brilliant style to a rather unexpected 2nd place during the Belgian National Championships Time Trial 2017 thanks to his 2-SPOKE wheel set! 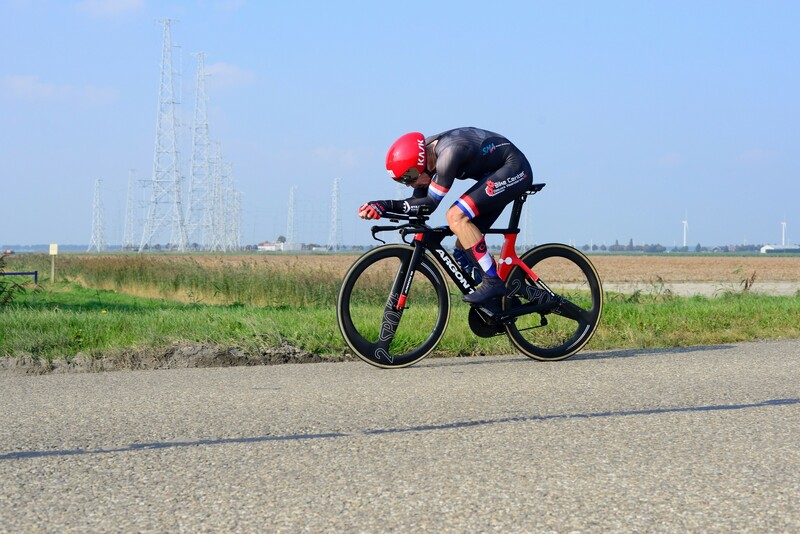 During the National Dutch Time Trial Championships last Wednesday the 21 st of June at ‘s-Heerenberg near the hilly German border, time trail specialist Remco Grasman became third on this 50.4 km long distance. Normally people would be very pleased with a result like this but Remco who had a miraculous season so far with his new 2-SPOKE wheel-set with 13 wins out of 13 time trials in the 2017 season was the man to beat… But a slowly deflating front tire almost made him crashing in a tight corner. This wheel shift with still 10 km to go delayed him quite a lot ( there was no spare bike). Looking back on images which were taken earlier during the race already showed a lower volume of the front tire. This wheel shift together with the increased rolling resistance in the period before this dropped him back from rating nr. 1 to rating nr.3…. 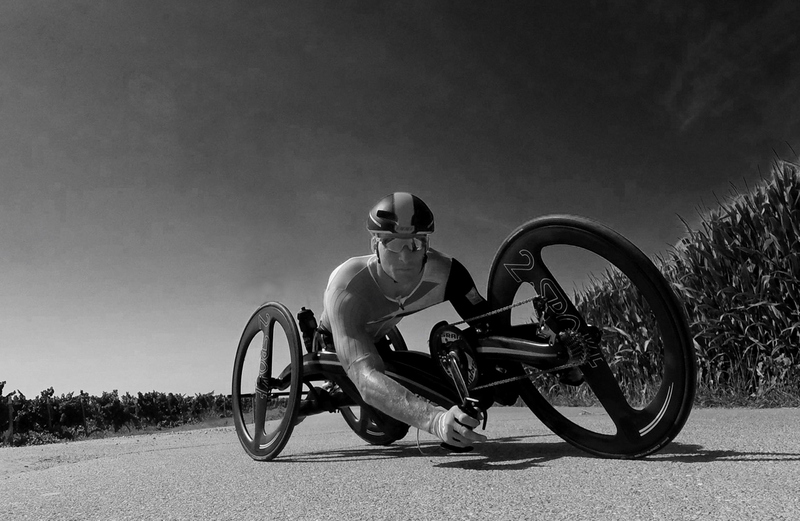 Jetze Plat, World Champion ParaTriathlon and World Champion Hand-biking (H4 class). Currently listed nr. 1 on the UCI rating! The results from Jetze with his 2-SPOKE wheels so far this year…. “Do the things you’re good in”. Thats the credo of Remco Grasman, 44 years old. Did originally start his sports career with running and duathlon sport. Always wants to be the best. And because he could not be the best any more due to an annoying foot injury, he is now cycling. He is busy now with his 4th season at top level. For professional top level racing he did start too late actually…Thats why he decided to focus on time trial. This has resulted in 2-time Dutch Champion in 2014 and 2016 at the Elite without a contract. In his daily life everything is as much balanced as possible: his training, his nutrition, his rest and very important: his material. Sometimes he drives at an average speed of 50 km/h and at that speed aerodynamics are very important. For example, fast wheels are very important and can make the difference between winning or loosing. At the World Cup time trial in 2014, where he became 3rd, the difference between the rainbow jersey and bronze was only 1.7 seconds!! With the 2-SPOKE wheels he can make this difference. As a set, he’s faster than with his former disc/3 spoke combination. This season he is faster than ever. Until now (June 17 th, 2017) he participated on 14 different time trial events in the Netherlands and Germany which he all won and most important: he improved all the existing track records as well! That’s partly because of his talent, but with 44 years he never drove so fast as this year. He no longer doubts about the 2-SPOKE wheels, which he did at the beginning of the season before he started using them. The wheels are very rigid, accelerate very quickly and especially with strong winds there is the biggest benefit. Aerodynamics are on a very high level: even the valve has been removed in the rim. There are simply no other wheels for him. 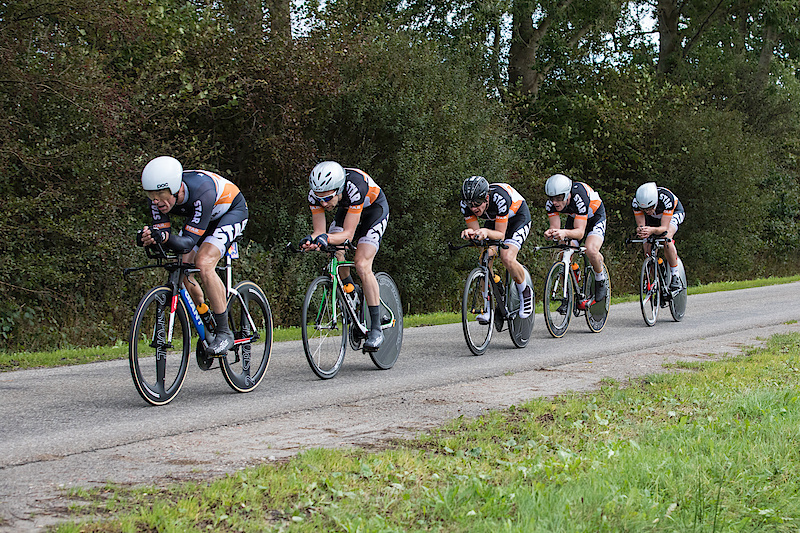 On June the 21 st, Remco will compete against the fastest pro’s (Dumoulin, van Emden, Lammerting and 50 more! ) 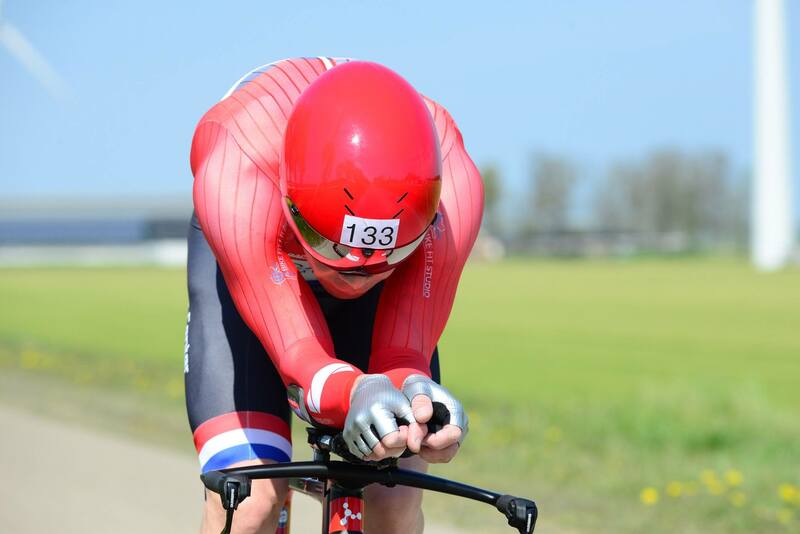 using his 2-SPOKE wheelset during the Dutch National Time Trial event. We keep you posted! VERY rigid and very fast wheels thanks to their 25 Watts power saving. 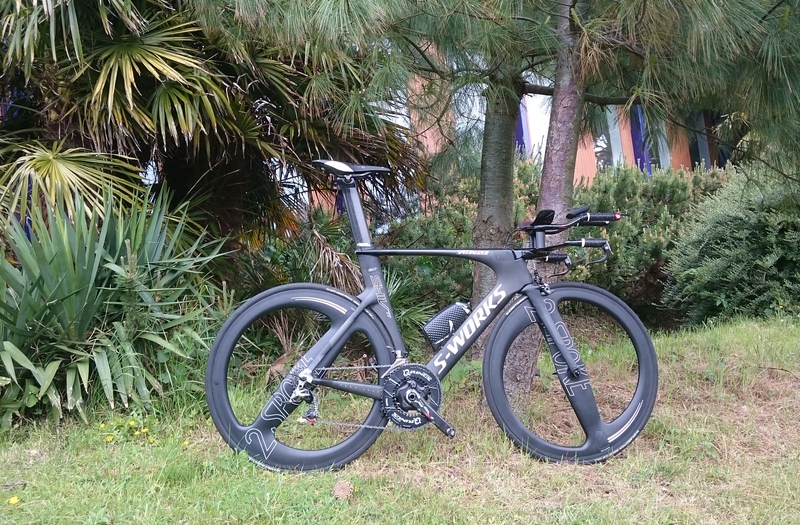 Improved my bike speed a lot and the best news is: even with the strongest side winds these wheels provide me a safe feeling while cruising relaxed at 42 km/h…. 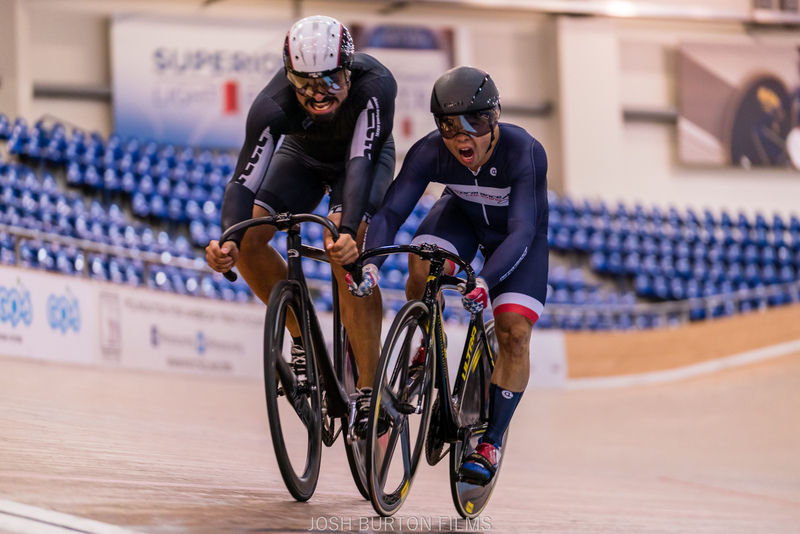 Results in 2017 are however promising again with first places at the World Cup Para Cycling in Mantiago, Italy and during the World Cup Cycling in Oostende, Belgium! For everyone, I try to achieve their own limits with good and smart training. The goal is that every athlete is in top shape at the right time. The body must be perfectly in order but the material too! Hence my choice for the best and fastest wheels on the market: 2-SPOKE!! The older triathletes will remember Pieter Aben as the man who always swapped last, and then drove to the head of the race on his bike. “Luckily, you can’t run so fast, I was told afterwards,” Pieter laughs back. A sprained ankle in 2012 forced the Nijmeeg athlete to focus on time trial, with the result that four national titles on this part have now been taken. 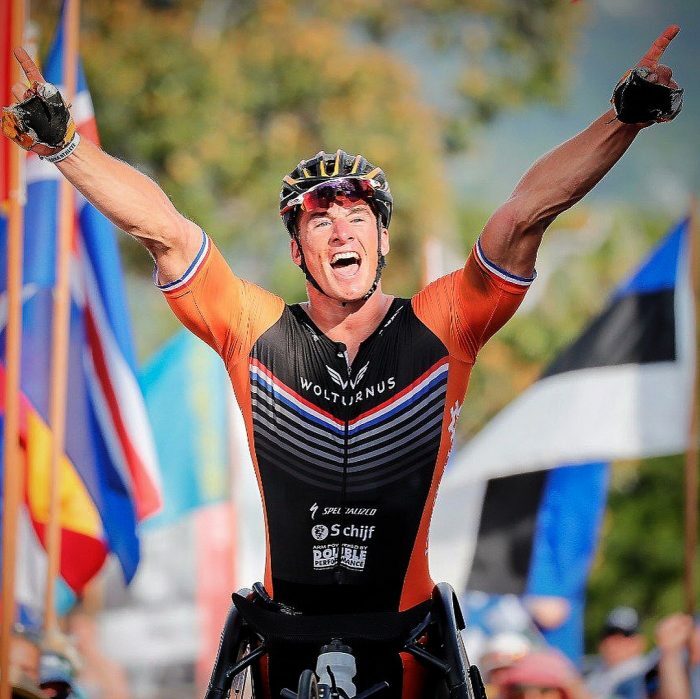 Pieter is the living example showing that an advanced age is not an obstacle to sport at a high level. “In 2012, for the first time, I became Dutch champion at the amateurs/masters, of course only in my age category 50+ but at the fastest time. And I’m not getting slower, I only notice that with the years one needs more rest and recovery. Number of wins: also 14 times……! not coincidentally, since his speed has improved a stunning 1,5 to 2 km with the same power output! 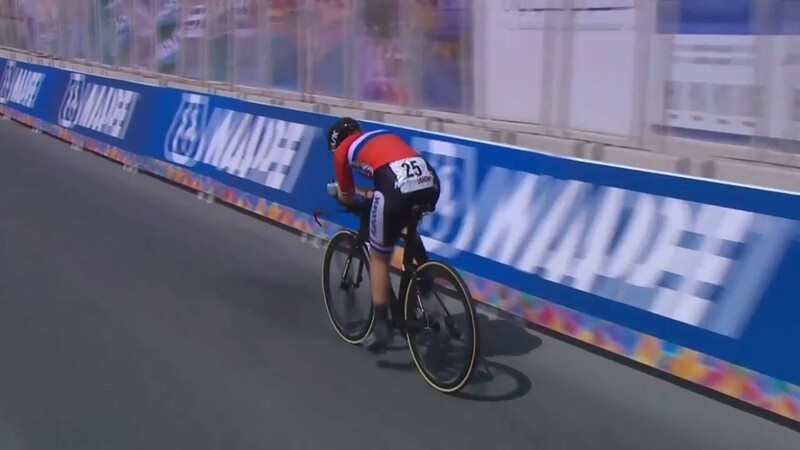 Remco Grasman did an outstanding job and beated professional cyclist and time trial expert Steven Lammertink (Lotto-Jumbo team) with almost 40 seconds in the same heat…. 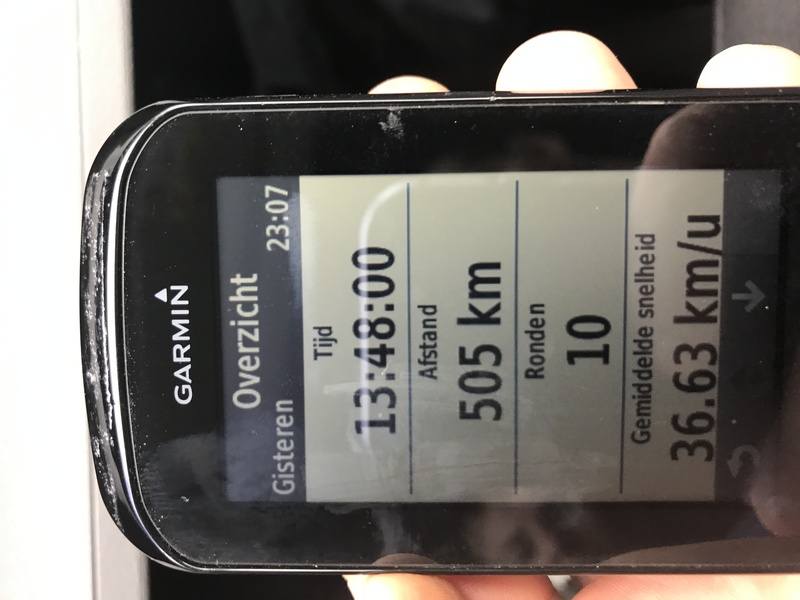 During the 16 km long VADESTO time trial on May the 16 th Remco covered this distance in a miraculous 48.98 km average whereas number two and professional cyclist Steven Lammertink used 38 seconds more resulting in a 1.5 km lower average speed. Last year Remco used 1 minute more then Lammertink in the same time-trial. Remco also improved this track record and has now improved EACH track record in the last 8! different time-trial events all over the Netherlands. 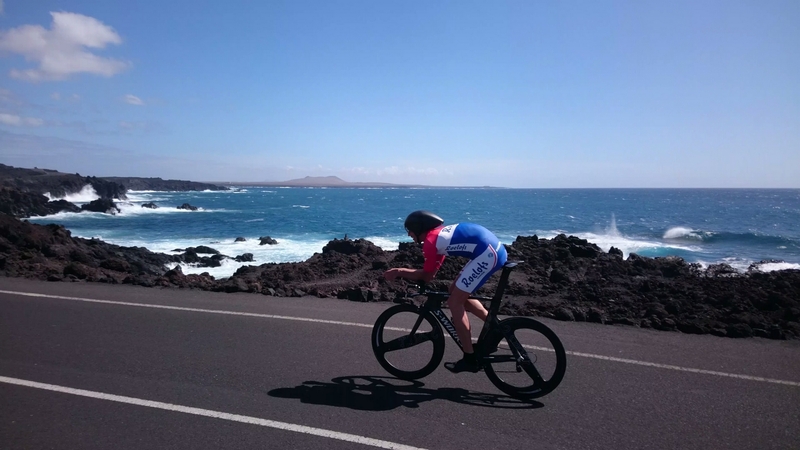 Triathlete trainer Pieter Aben now promoting “2-SPOKE” on the triathlon eldorado at Lanzarote island. It took Pieter Aben only one single bike trip with his Specialized S-works to be convinced about the incredible aero benefits of the 2-SPOKE wheel set. In his words: the “brick wall speed limit” has moved upwards by almost 2 km!! Alyda Norbruis wins time trial during Worldcup competition Maniago , Italy (12 May 2017) with 2-SPOKE wheels. 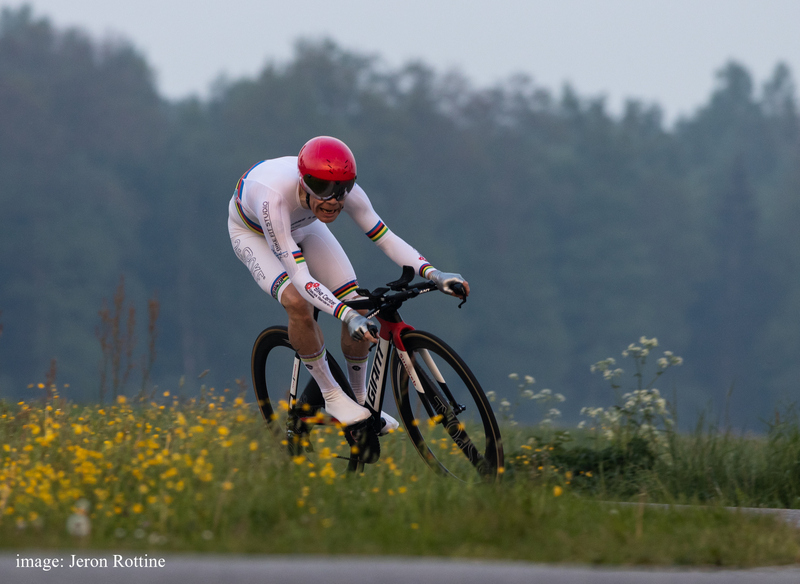 During three different time trial events today May the 12th 2017 the 2-SPOKE wheels were again the fastest with a first place for Women C2 category Alyda Norbruis (double gold medallist in Rio 2016) , a first place for Jetze Plat (gold and bronze medallist in Rio 2016) in the very competitive H4 class and a first place for Tim de Vries in the H5 class. It looks like normal but it is absolutely not…. Today Remco Grasman won the 4th!! time trial in a row this month over a distance of 34.45 km despite a very strong participant field and a very hard wind. Lots of profit from the 2-SPOKE wheels!! Remco reached an average speed of 49.3 km/h! And Guido Vroemen’s coaching works as well. Remco never finished a time trial of this length above 49 km/h average. This of course is not coincidental. O.K., Remco is with his 44 years of age a truly unbelievable time-trial cyclist but he confirms that he’s riding like 1 to 2 km’s faster with his 2-SPOKE wheels depending on wind conditions and directions PLUS he can use them in very strong wind conditions where other people are almost blown away with their full disc-, 3-, 4- or 5 spoke wheels. Under again very cold conditions Remco amazed himself, the partcipants and the organisation with yet another victory and track record! Remco absolutely smashed the rest of the field with an astonishing 47.59 km while Beaufort 5 was blowing from the north east. He was like two kilometre faster then the nr. 2. And that’s not all… despite the cold (12 degrees) and stormy (Bft.5) weather a new track record was set. While everyone was complaining about the strong side winds Remco used the energy of the wind with his 2-Spoke bladed wheels! TRACK RECORD for Remco Grasman with 2-SPOKE wheel set. 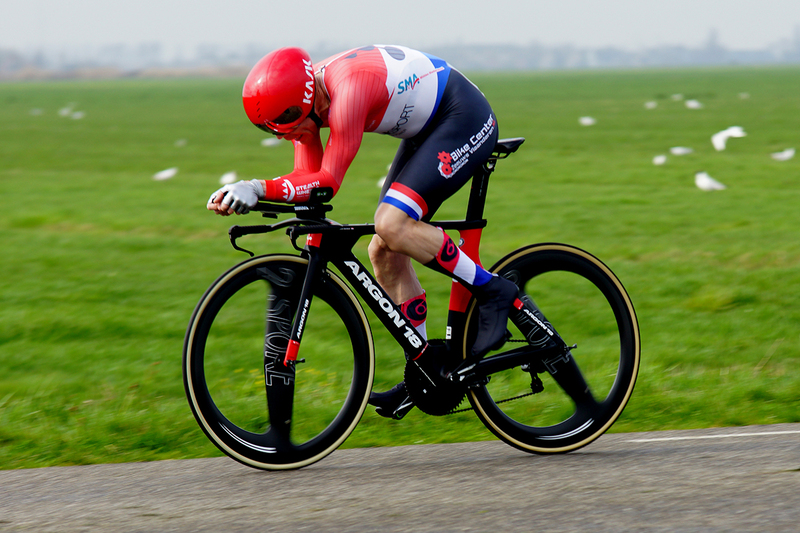 Remco Grasman wins the years first time trial in Warns (7.3 km with standard traffic…) He set a track record time with the use of the 2-SPOKE wheel set and reached an average of almost 50 km/h. Although this was already his fifth successive year, it was his fastest time ever! Wondering if cross winds will be converted to free speed! Check the article in Bike Radar. 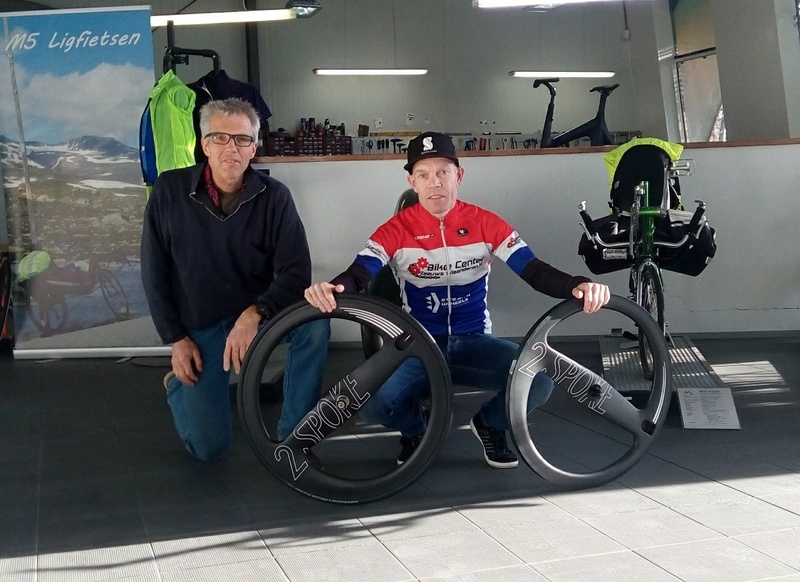 Last week Bram Moens delivered officially a brand new set of 2-SPOKE wheels to Remco Grasman. Remco will use these fastest wheels in the world in the coming 2017 competition. We will keep you updated about the results! 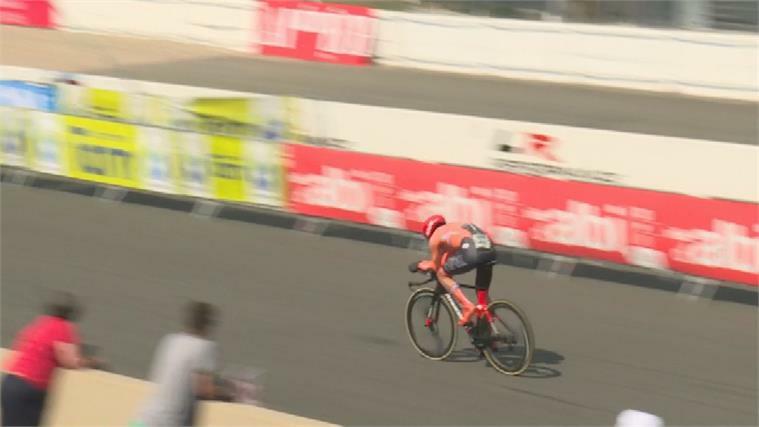 Maaike Boogaard in action with 2-SPOKE wheels during the World Championships in Qatar at the Women Juniors Individual Time Trial. In below video Maaike can be seen at 32:39, 45:06 and 50:23. M5 2-SPOKE wheels are used by the worlds fastest professional bicyclists and hand-bikers. Among them the current Paralympic and world champion Triathlon 2016 Jetze Plat and many more professional cyclists like world champion and two times Paralympic gold medalist Alyda Norbruis (Rio 2016). Also the TEAM.NL tandem with Vincent ter Schure and Timo Fransen have used the 2-SPOKE in the 20 km time trial with a silver medal as result.